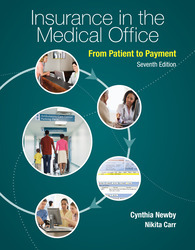 The seventh edition of Insurance in the Medical Office: From Patient to Payment emphasizes the medical billing cycle—ten steps that clearly identify all the components needed to successfully manage the medical insurance claims process. Studying this cycle shows how administrative medical assistants must first collect accurate patient information and then be familiar with the rules and guidelines of each health plan in order to submit proper documentation and follow up on payments. This ensures that offices receive maximum, appropriate reimbursement for services provided. Without an effective administrative staff, a medical office would have no cash flow! Insurance in the Medical Office is specifically targeted to Medical Assisting students and addresses the role they play in contributing to the financial success of the medical office. The book is tailored to the specific needs of medical assistants as they handle office administration tasks. Content and coverage have been updated and refocused to provide a practical, targeted overview of medical insurance and billing. Expanded introduction to ICD-10-CM, with an optional chapter covering ICD-9-CM and ICD-10-CM available through McGraw-Hill's Create. Starting in Chapter 3, in-chapter Exercises give students the opportunity to get hands-on experience with key Practice Management Program tasks through simulations of real software. Completing on-the-job tasks relating to PMPs is an important aspect of a medical assistant’s work. Insurance in the Medical Office offers options for completing these tasks: Connect Plus for simulated Medisoft exercises, as well as paper claim forms and the electronic CMS-1500 form for claims exercises. Pedagogy Updates: Learning Outcomes are restated using the revised version of Bloom’s Taxonomy to teach and assess critical thinking about medical insurance and coding concepts. Major chapter heads are now structured to reflect the numbered Learning Outcomes. Key terms are now defined in the margins for easy reference, and are listed in the Glossary. Billing Tips and Compliance Guidelines highlight key concepts or provide additional tips to help students navigate through the material. “Thinking It Through” questions have been added at the end of each section to assess each Learning Outcome. New Chapter Summaries have been created in a tabular, step-by-step format with page references to help with review of the material. End-of-chapter elements are now tagged with Learning Outcomes. The Chapter Review section includes: Using Terminology—matching questions; Checking Your Understanding—multiple choice and short answer questions; and Applying Your Knowledge—cases. McGraw-Hill's Connect Plus includes all End-of-Section and End-of-Chapter questions, as well as simple interactives for each chapter. Extensive instructor resources are available at www.mhhe.com/newbycarr, including the Instructor's Manual, Electronic Testbank, PowerPoint Slides with Teaching Notes, Sample Syllabi, Competency Correlations and an asset map. Cynthia Newby, CPC, CPC-P, is a long-serving author who works closely with McGraw-Hill Education instructional development staff to develop excellent MIBC programs. Cynthia is a graduate of Hood College and a trustee of that institution as well as her local animal shelter and library.